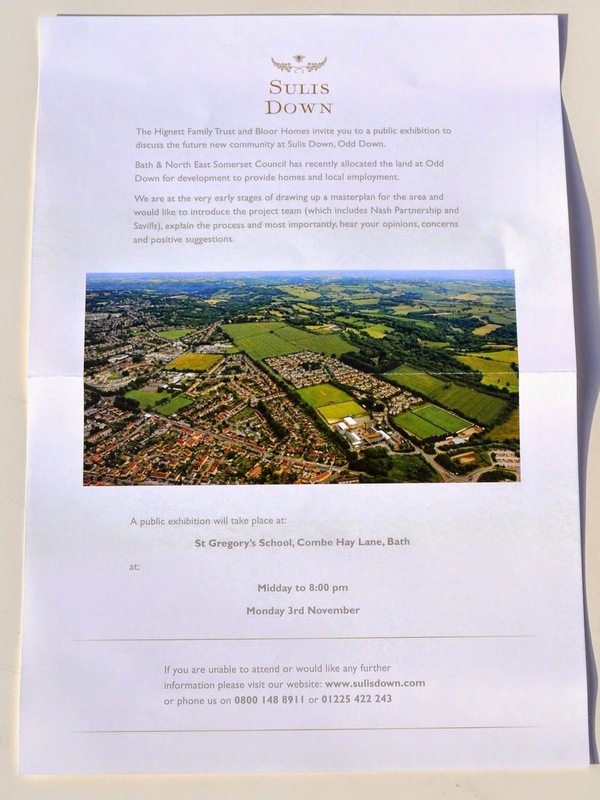 As some of you may have already read in the Bath Chronicle, the new community of 300 homes to be built on South Stoke Plateau is to be known as Sulis Down. Bloor Homes has been appointed to develop the former green belt land south of Bath, next to Odd Down and the Sulis Manor estate. The Hignett Family Trust appointed Bloor Homes from a wide range of house builders, while Bath-based architects Nash Partnership will lead the Sulis Down master planning. An exhibition is planned for November 3 at St Gregory's School, Combe Hay Lane, Odd Down, Bath. It will take place between noon and 8pm. The invitation (to the left) sent to all the communities surrounding South Stoke Plateau also features phone numbers and a website for those wanting further information. At the time of writing this post, the website at www.sulisdown.com was not working.